The main idea behind responsive web design is that a website has the ability to change and adjust, based on the device that is being used. Without a responsive design, people on cell phones or tablets will not be able to view everything the site has to offer, which will make them likely bounce away right after landing on the site. 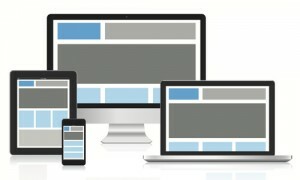 Some of the primary reasons every business needs to implement a responsive web design are highlighted here. Almost 70 percent of all Americans are using mobile devices, such as tablets and smart phones, for internet searches. They will also have very minimal patience waiting for a site to come up, which means customers will leave a site that is unresponsive, rather than attempt to navigate through it. For businesses that have competitors that are already responsive, not catching up can be disastrous. If the competitors for a business are not yet offering a responsive design, then utilizing it first will provide an advantage that can lead to an increase in profits. When a business invests in the creation and maintenance of one responsive website, it will be much more affordable than having to maintain both a website, as well as a separate mobile site. The fact is that responsive web design is no longer a “maybe” element to a marketing strategy. It is a must have and one that all businesses should invest in. If you are interested in learning more about responsive web design, contact the professionals at Top Marketing Agency by calling (888)843-9840 today for more information.